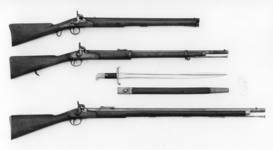 For the Lancaster rifle XII.326 (formerly XXIV.105). Almost straight, single-edged blade with a pronounced rib running down the back; for about 300 mm (12 in.) from the tip there is a semi-elliptical back edge. Brass hilt with fibre grip scales, the quillon pierced for the muzzle, a spring catch at the back of the grip. Leather scabbard with brass locket and chape. On pommel, on inside, stamped: crown over 18.On pommel, on top, stamped: 3452.On blade, on inside, near hilt, stamped: crown over 16. C ffoulkes, Inventory and Survey of the Armouries of the Tower of London, London, 1916, II, p. 321. P J Lankester, ''Land Transort Corps swords' in the Royal Armouries: and interim summary', Royal Armouries Yearbook, 6, 2001, pp. 55-71, at p. 70, n. 17. For the pattern generally see I D Skennerton and R Richardson, British and Commonwealth Bayonets, Margate, Australia, 1984, pp. 121-24 (no. B160). 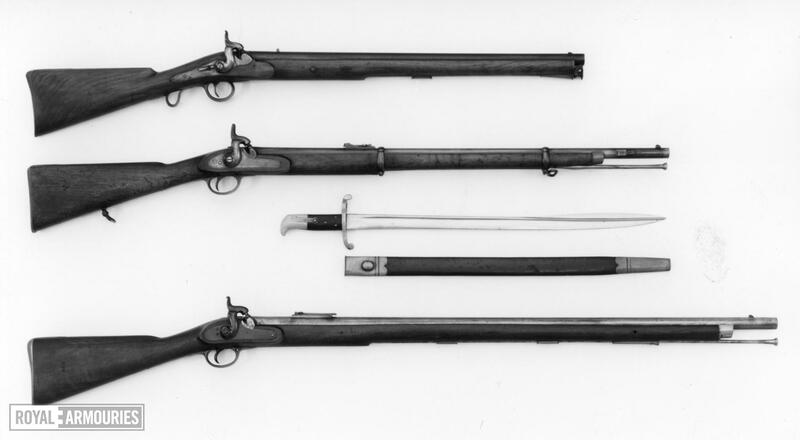 Skennerton and Richardson, in part following Watts and White, distinguish and early version of the pattern, probably dating to before 1858 and corresponding with X.136, on which the leaf spring is slightly shorter and attached by a rivet rather than a screw and where the grip is more faintly checkered than on the later version. X.135 appears to correspond to this eraly version but the grip is somewhat less faintly checkered than on the example illustrated by Skennerton and Richardson. For other examples of this probably early version so far noted in the Royal Armouries, see entry for X.136, under Notes.